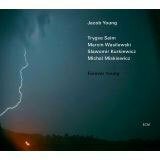 Norwegian guitarist Jacob Young continues mapping out his own exquisite path on his third ECM outing. This time, he teams up with the Poland-based Marcin Wasilewski Trio to deliver spellbinding originals that place maximum emphasis on spatial awareness and transfixing melodies. Wasilewski’s piano accompaniment, in particular, works delightfully in tandem with Young’s spidery lines. Fellow Norwegian Trygve Seim contributes to the billowy splendor too, blowing carefully drawn melodic passages on tenor saxophone. The airy arrangements afford Young plenty of room to showcase his comely, full-bodied sound and his effortless manner of unraveling melodically cogent improvisations. His gifts as a composer are on full display as well, and he demonstrates an intriguing way of enveloping pop and rock motifs into soft-hued modern jazz. The riffs that start and underscore the elegant “We Were Dancing” are immediately infectious; they give way to Seim articulating a beautiful melody that has the accessibility of a pop ballad. The guitarist shows a flair for the Spanish tinge on the suspenseful “1970,” which at times nods to Al Di Meola’s work with Return to Forever but with less frantic energy, and on the lovely “Sofia’s Dance,” on which drummer Michał Miśkiewicz taps out hypnotic rhythmic figures. Other compositions, like the hymnal “My Brother” and idyllic “I Lost My Heart to You,” also suggest Young is a burgeoning talent to watch-not just a splendid guitarist but a noteworthy composer too.